Former Mayor and Distinguished Professor of History and Political Science at Belmont Karl Dean has co-written a book about Nashville’s 25-year run of success with reporter and writer Michael Cass. Dean led Nashville through a period of dynamic growth and change during his two terms as the city’s Mayor. The book, Nashville: The South’s New Metropolis, explores the redevelopment of downtown, the arrival of major league sports in the 1990s, the city’s increasing diversity and its entrepreneurial spirit. The burgeoning restaurant scene and the transformation of the Gulch and SoBro into lively urban neighborhoods share the spotlight with the evolution of Nashville’s bedrock industries: health care, higher education, tourism and, of course, music. 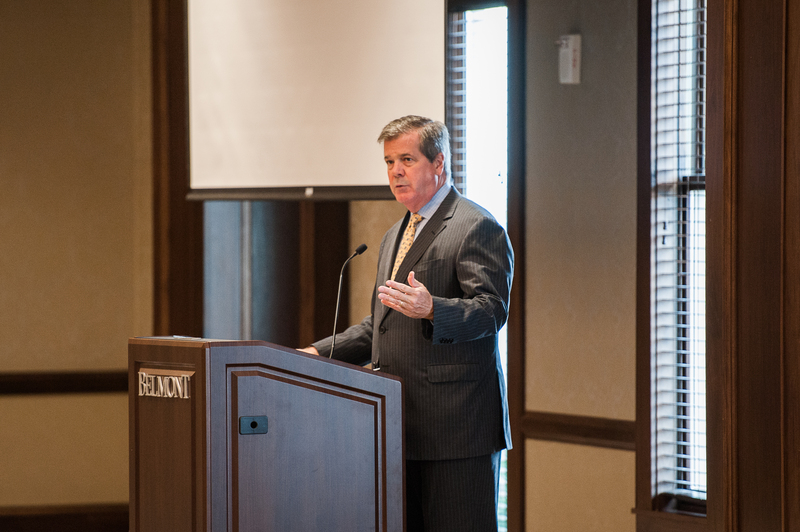 Dean, who served as mayor for eight years, led the city through the Great Recession and the historic 2010 flood by continuing to bet on Nashville and invest in its future. The new book, full of photographs showcasing the city’s people and places, captures the advances made under the leadership of former mayors Phil Bredesen (1991-1999) and Bill Purcell (1999-2007). Published by Memphis-based CityInk as the latest title in its Urban Renaissance Books series, the book includes interviews with and insights by musicians Jack White, Vince Gill and Ketch Secor, leader of the band Old Crow Medicine Show; author and Parnassus Books Co-Owner Ann Patchett; HCA Co-Founder Dr. Thomas Frist Jr.; businesswoman, philanthropist and arts champion Martha Ingram; Conexion Americas Co-Founder and Executive Director Renata Soto; Bishop Joseph Walker of Mt. Zion Baptist Church; restaurateurs Margot McCormack and Benjamin and Max Goldberg and many others. Mayor Megan Barry, who succeeded Dean in 2015 and is building on her predecessors’ work while beginning to put her own stamp on the city, wrote the introduction. Dean served as mayor from 2007 to 2015. He has lived in Nashville for more than 30 years since moving to the city for law school at Vanderbilt University. Cass worked as a reporter for The Tennessean for 15 years before joining Dean’s administration in its final year as speechwriter and communications adviser. He now holds the same position in Mayor Barry’s administration. Six photographers, led by Memphis-based Stephanie Norwood, captured hundreds of beautiful images of Nashville to accompany and illustrate the text by Dean and Cass. Nashville: The South’s New Metropolis is available for purchase at Parnassus Books, Barnes & Noble at Vanderbilt and Broadway Entertainment and online here. Journalists who need a copy of the book for review or reporting purposes should contact Michael Cass at michael_cass@hotmail.com.